The growing economic relationship between China and Africa is one of the great trends to watch in world affairs. (The political relations have always been fairly strong.) But the sheer lack of coherence, mangling of facts and analytical hysteria attending the bandwagon of commentary on the subject threatens to drive the sober observer livid with rage. FALSE: Chinese aid to Africa comes with no strings attached; ergo China, deservedly, excels at economic diplomacy on the continent, and is benefiting as a result. Chinese aid does come with strings attached, but they tend to be somewhat more predictable and easier for elites to swallow, regardless of the actual effects on the host country's economy. Such strings include the disavowal of Taiwanese sovereignty or the suppression of very loud local critics (case in point: Sata in Zambia), favoring Chinese contractors and China-sourced goods and guaranteeing unrelated investments for the long-term. FALSE: China is on a spending binge across the developing world and is thus crowding out longstanding players from the Gulf, Europe, India, etc. China's outward foreign direct investment (F.D.I.) is still probably less than 5 percent of total state investment (in 2006, it was less than 2 percent). Though growing considerably, the growth is from a low base. China will become increasingly more important, but that does not mean its importance should be exaggerated. In fact, of this relatively small outward flow of money, Africa gets about 9 percent (it was less than 6 percent in 2007). China isn't throwing every dime it has at Africa. Moreover, Chinese money tends to be concentrated very densely in a few choice spots like Australia and Angola, making the total effect even less pronounced than has often been suggested. 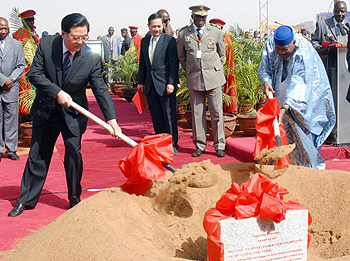 China's aid transfers to Africa are likewise usually blown out of proportion. China itself is a major recipient of multilateral aid to the tune of about $1.4 billion per annum, a fact not widely known. China, among all the prominent givers, is nearly unique for preferring loans to grants as the main form of assistance it lends to African countries. Aid, even in the form of grants, has helped mess up Africa's ability to think through its circumstances and develop homegrown solutions to problems. China's total aid assistance to Africa, to date, is about 1 percent of what more traditional donors have doled out over the past half-century to little effect. Beijing may be ramping up the donations to selected countries on the continent, but at present the flow is far from being a flood. Furthermore, the Asian giant gives as much as four times what it gives to Africa to its clients in its principal sphere of diplomatic activity in the Pacific and elsewhere. There is no mistaking the Asian giant's current priorities. As a reforming China reorders the structure of global capitalism by discrediting once-sacred notions of the international division of labor, and as an emerging Africa reorients its own position to the global capitalist system, clear synergies will become self-evident. There is no doubt that the opacity of China's foreign relations, its ruthless censorship domestically and the unreliability of its economic statistics partially block our view of what is ahead. But exaggerating the Sino-African situation—willfully ignoring counter-trends and unfashionable evidence, distorting facts and figures—could undermine the ability of Africans to develop sound policy for the management of their relationship with the burgeoning Asian power. It may distort the incentives for Africa's own reforms and lead to unrealistic and self-damaging expectations of what is good and durable in the expanding Sino-African space. So, while China's rise in Africa may not exactly be a mirage, it is definitely not the awe-inspiring miracle it is being painted to look. The most exciting and momentous developments are still ahead, which is great, as it offers the opportunity for Africans to figure out how to get the relationship right, for the benefit of the African people and not just a small business and political elite. That was the challenge that Africans failed to overcome in the Cold War, when competing powers vied for their attention. Africans should not repeat the same mistake.